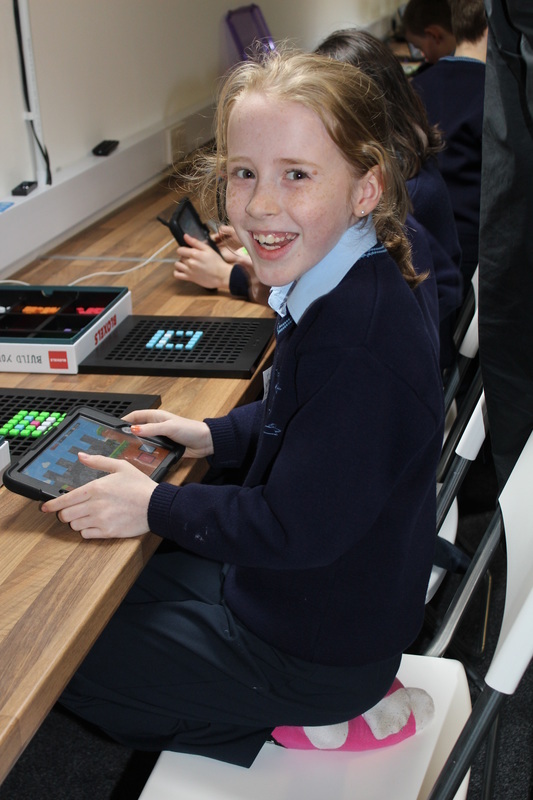 On Thursday 22nd of February 2018, Lacken National school was invited to the official launch of the DREAMSPACE room in Microsoft's new headquaters in Lepardstown. Students from 4th 5th and 6th class were given the oppertunity to go. When we arrived, we were greeted with a new state of the Art, massive building. It was out of this world. We were shown the DREAMSPACE room where we had been asked to engage in some activities such as Minecraft and Robotics .The room was large and had lots of interactive screens and robotic tasks for us to complete. As it was the opening of the new Microsoft building, there were a lot of people around . The minster of Higher education (Mary Mitchel O Connor) came in to the DREAMSPACE room and asked us question as to what we were doing. It was fun coding​. Then the Taoiseach Mr Leo Varadkar came in and met us. He sat down with us for a few minutes and asked us a few questions. Then we swapped tasks. We had an excellent day and it was one experience we will never forget. In a few months we hope to come back. ​Well, we've done it, our STEAMroom (Science, Technology, Engineering, Art, Maths) a sort of a Makerspace come Coderdojo in Lacken NS has finally opened and according to all sources, the first in Ireland. I'll be honest, it has taken a huge effort by numerous people, plenty of missed weekends and long evenings, but most definitely worth all the effort. Our 'STEAMgeneers' the kids, have well and truly flipped the classroom, we've gone from having 1 teacher in the room to many! Just to give you taste of what we are trying to achieve check out this video produced by the people at EXCITED.ie, (another big thank you) from the launch day on the 16th of March 2016. As one of our STEAM mentors said on the day, "this is only the beginning, the work has only just begun". With that said, I'll be updating our blog with ongoing events, programs and activities. We will be cranking up our after school activities over the next couple of weeks starting with a Craft Club on Tuesdays from 3pm until 4pm. We will also be offering an absolute beginners course in computer and online skills for parents. The training programme will be free, limited to 9 adults and run over 4 consecutive weeks with each participant receiving a certificate as part of National Digital Strategy from the Department Of Communications BenefIT scheme. Let's hope that we can inspire more primary schools around the country to try something new or maybe to come and visit, share their knowledge and have a play, the 'Drones' are charging!!!! This is the place to keep an eye on what's going on in Lacken National School's STEAMroom. If you're interested in keeping up to date with what's going on in EdTech, you can follow @tonyrileynz on twitter.